Office 365 offers two versions for your use - Office Online & Office ProPlus 2016. Office Online allows you to work on your documents anywhere you have a connection to the internet. All Office applications are hosted on internet, you do not need to install any Office components in your local computer. Office ProPlus 2016 allows you to install Office components on up to five PC or MAC computers enabling you to work anywhere, without an internet connection. You can synchronise your information the next time you connect to the web. 1. Can I share my Microsoft Forms? For users to submit their responses: This is used when your form is complete, and you are ready for others to view, and respond to your form. Their responses are recorded in the Responses section. Users with this link will only be able to submit responses to your form. For users to use your form's template: This option allows others to copy your form to use for themselves. The link allows them to recieve a duplicate of the form's questions. Don't worry, the copied form does not receive the original forms responses. For users to collaborate with you on your form: This option allows others to view and edit your form's questions, options, and responses - anyone with this link can change your form. This is convenient for team collaboration and results sharing. We will walk through each method of sharing. 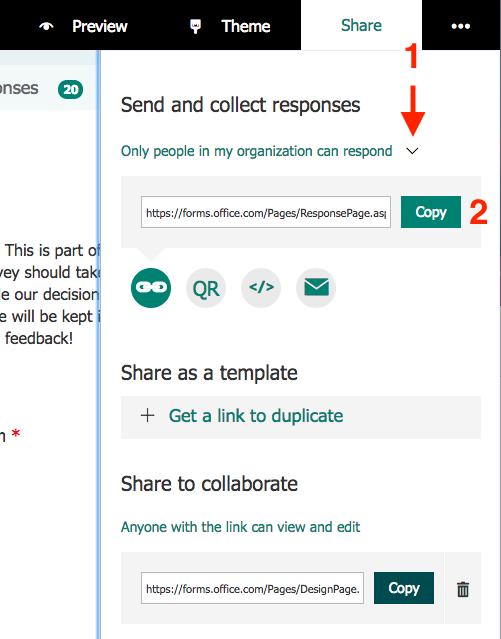 Under Share to collaborate, use the generated link to collaborate on your form. Before we begin, there are some things you will need in order to update your email signature with a snazzy picture. Select the right column, and type in your email signature. Drag your AUP logo from your desktop in to the left table column. Tip: to resize the logo, click the logo, then drag it's borders to the desired size. Office 365 Mail account - When you change your signature on one of the outlook applications (Windows, Mac, or through Office 365) , it does not update the other outlook applications. So if you plan to send email from a Mac, PC, and through the browser, you will have to go through all three tutorial sections (dont worry, they dont take very long!). Click enter on your keyboard to start a new line, then enter your signature as desired. 4. How to install Office 2016 on my computer ? You can install Office 2016 on your PC or MAC by logging in to your AUP office 365 portal. On your dashboard you will be able to see a red 'Install now' button. Click on 'Install now'. You will see a file downloading, with a file name similar to Setup.X86.LANGUAGE-COUNTRY_O365ProPlusRetail_(serial_serialNumber).exe . Open this file and follow the installation instructions. After completing the installation, it is recommended that you reboot your computer. You can also click here see a step-by-step procedure (with videos) showing how to install Office 2016 on your PC or MAC. If you need assistance, you can walk-in to the AUP IT service desk, or make an appointment by contacting helpdesk@aup.edu . 5. I already have an Office 365 subscription and Office applications are already installed on my personal computer. How can I associate my computer Office applications with my AUP Office 365 account? If your office version is older than 2013 , then you will have to uninstall your old version. 6. How do I start using Office 365? To start using Office 365 at AUP, you will be contacted by ITS to schedule a date to migrate your email, calendar, and contacts to Office 365. If you wish to migrate ahead of schedule, please contact ITS to arrange a date. How can I start learning about Office 365 ? Click here to start learning how to use Office 365. ITS will work with you before, during, and after the migration to Office 365 in order to ensure a smooth transition to Office 365. What should I expect to see when I start using Office 365 ? Once you are logged in to Office 365, you will see the familiar Office products that you are already using at AUP: mail, calendar, contacts, Word, Excel, and Powerpoint. What about my AUP files ? How do I login to Office 365? Enter your AUP NetID with @aup.edu. Example: jsmith@aup.edu. After logging in, you will see a screen similar to the following. Click on any of the icons to use Office 365 components. Can I work online with my Internet connection? What if I do not have access to Internet ? You can use the Microsoft Office online components with your internet connection - Word Online, Excel Online, Powerpoint Online, OneNote Online. Or you can download the software to your laptop, desktop, tablet, smartphone, or other devices (up to 5). To work offline, download the Office 365 components you need: Word, Excel, PowerPoint, or Outlook. To access your AUP mail, click on Mail. To access your AUP calendar, click on Calendar. To access your AUP contacts, clock on People. To access your AUP Word files, click on Word Online. To access your AUP Excel files, click on Excel Online. To access your AUP Powerpoint files, click on PowerPoint Online. To access your AUP files, use Windows Explorer. To move your AUP files to Office 365, click on OneDrive and upload your files from MyFiles. To work offline, download the Office 365 components you need: Word, Excel, PowerPoint, or Outlook. 7. What features are in Office 365? Office 365 includes the familiar Office tools that you are already using at AUP, such as Mail, Calendar, Contacts, Word, Excel, and Powerpoint. 8. What is Office 365? With Office 365, you can work either online using your internet connection or offline using your installed versions of the Microsoft Office software that you are already using at AUP: Mail, Contacts, Calendar, Word, Excel, and Powerpoint. In addition to the Office components that you are already using, there are several new features that are also available with Office 365 to enhance collaboration and sharing of information with AUP colleagues and students. Organize your files with 1 terabyte of space using OneDrive . Share ideas with your AUP colleagues, students, and project groups using Yammer. Manage your AUP work using Projects, Planner, and Tasks. Collaborate in real-time and develop course material using OneNote and Class Notebook. Communicate with project groups using Skype for Business. Brainstorm and map out concepts using Sway, a digital storytelling app. Find information easily across all your AUP data using Delve. Office 365 makes it easier to share documents and work with AUP colleagues and students at the same time. Brainstorm and collaborate with colleagues by coauthoring in Word, PowerPoint, and OneNote. Improved version history lets you refer back to snapshots of a document during the editing process. Review, edit, analyze, and present your documents across any of your devices —from your PC or Mac to your Windows, Apple®, and Android™ phones and tablets. From AUP to home to your favorite café, stay connected to what's important— AUP coursework, research, projects, and communication using all of your devices. Easily save your AUP information to your online cloud storage and switch from one of your devices to the next without missing a beat. Office apps pick up right where you left off, regardless of the device you were using.